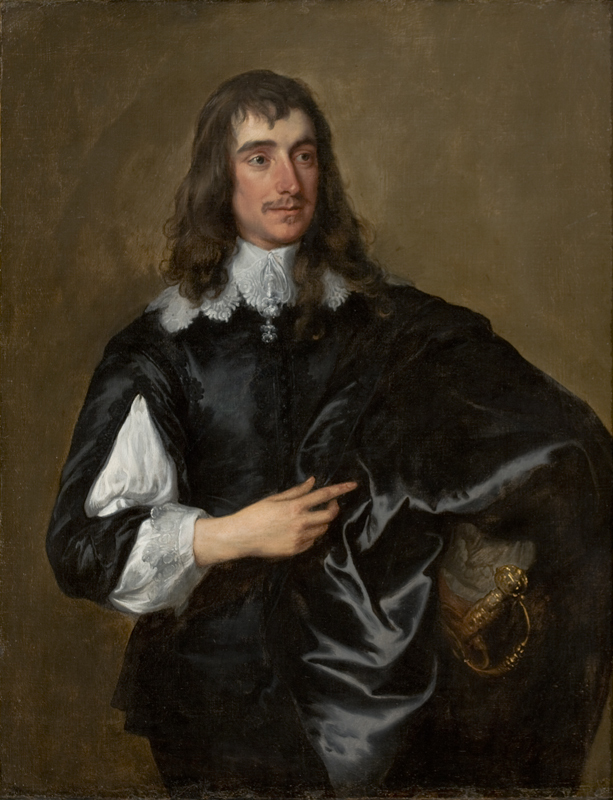 Besides friendship for his brother, and a regard to the right of succession, there were many strong reasons which had determined Charles to persevere in opposing the exclusion. All the royalists and the devotees to the church, that party by which alone monarchy was supported, regarded the right of succession as inviolable; and if abandoned by the king in so capital an article, it was to be feared that they would, in their turn, desert his cause, and deliver him over to the pretensions and usurpations of the country party. The country party, or the whigs, as they were called, if they did not still retain some propensity towards a republic, were at least affected with a violent jealousy of regal power; and it was equally to be dreaded that, being enraged with past opposition, and animated by present success, they would, if they prevailed in this pretension, be willing, as well as able, to reduce the prerogative within very narrow limits. All menaces, therefore, all promises were again employed against the king’s resolution: he never would be prevailed on to desert his friends, and put himself into the hands of his enemies. And having voluntarily made such important concessions, and tendered, over and over again, such strong limitations, he was well pleased to find them rejected by the obstinacy of the Commons; and hoped that, after the spirit of opposition had spent itself in fruitless violence, the time would come, when he might safely appeal against his Parliament to his people. So much were the popular leaders determined to carry matters to extremities, that in less than a week after the commencement of the session, a motion was made for bringing in an exclusion bill, and a committee was appointed for that purpose. 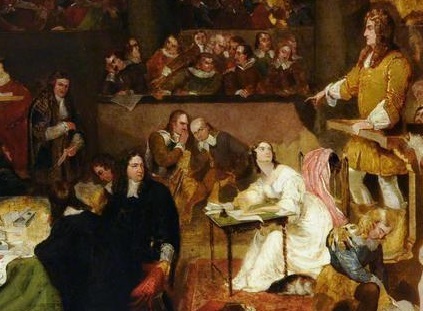 This bill differed in nothing from the former, but in two articles, which showed still an increase of zeal in the Commons: the bill was to be read to the people twice a year in all the churches of the kingdom, and every one who should support the duke’s title was rendered incapable of receiving a pardon but by act of Parliament. The debates were carried on with great violence on both sides. The bill was defended by Sir William Jones, who had now resigned his office of attorney-general, by Lord Russel, by Sir Francis Winnington, Sir Harry Capel, Sir William Pulteney, by Colonel Titus, Treby, Hambden, Montague. It was opposed by Sir Leoline Jenkins, secretary of state, Sir John Ernley, chancellor of the exchequer, by Hyde, Seymour, Temple. The arguments transmitted to us may be reduced to the following topics. In every government, said the exclusionists, there is somewhere an authority absolute and supreme; nor can any determination, how unusual soever, which receives the sanction of the legislature, admit afterwards of dispute or control. The liberty of a constitution, so far from diminishing this absolute power, seems rather to add force to it, and to give it greater influence over the people. The more members of the state concur in any legislative decision, and the more free their voice, the less likelihood is there that any opposition will be made to those measures which receive the final sanction of their authority. In England, the legislative power is lodged in King, Lords, and Commons, which comprehend every order of the community: and there is no pretext for exempting any circumstance of government, not even the succession of the crown, from so full and decisive a jurisdiction. Even express declarations have, in this particular, been made of parliamentary authority: instances have occurred where it has been exerted: and though prudential reasons may justly be alleged why such innovations should not be attempted but on extraordinary occasions, the power and right are for ever vested in the community. But if any occasion can be deemed extraordinary, if any emergence can require unusual expedients, it is the present; when the heir to the crown has renounced the religion of the state, and has zealously embraced a faith totally hostile and incompatible. A prince of that communion can never put trust in a people so prejudiced against him: the people must be equally diffident of such a prince: foreign and destructive alliances will seem to one the only protection of his throne: perpetual jealousy, opposition, faction, even insurrections will be employed by the other as the sole securities for their liberty and religion. Though theological principles, when set in opposition to passions, have often small influence on mankind in general, still less on princes; yet when they become symbols of faction, and marks of party distinctions, they concur with one of the strongest passions in the human frame, and are then capable of carrying men to the greatest extremities. Notwithstanding the better judgment and milder disposition of the king, how much has the influence of the duke already disturbed the tenor of government? how often engaged the nation into meaures totally destructive of their foreign interests and honour, of their domestic repose and tranquillity? 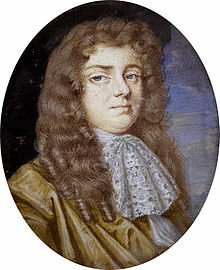 The more the absurdity and incredibility of the popish plot are insisted on, the stronger reason it affords for the exclusion of the duke; since the universal belief of it discovers the extreme antipathy of the nation to his religion, and the utter impossibility of ever bringing them to acquiesce peaceably under the dominion of such a sovereign. The prince, finding himself in so perilous a situation, must seek for security by desperate remedies, and by totally subduing the privileges of a nation which had betrayed such hostile dispositions towards himself, and towards every thing which he deems the most sacred. It is in vain to propose limitations and expedients. Whatever share of authority is left in the duke’s hands, will be employed to the destruction of the nation; and even the additional restraints, by discovering the public diffidence and aversion, will serve him as incitements to put himself in a condition entirely superior and independent. And as the laws of England still make resistance treason, and neither do nor can admit of any positive exceptions; what folly to leave the kingdom in so perilous and absurd a situation, where the greatest virtue will be exposed to the most severe proscription, and where the laws can only be saved by expedients, which these same laws have declared the highest crime and enormity. The court party reasoned in an opposite manner. An authority, they said, wholly absolute and uncontrollable is a mere chimera, and is nowhere to be found in any human institutions. All government is founded on opinion and a sense of duty; and wherever the supreme magistrate, by any law or positive prescription, shocks an opinion regarded as fundamental, and established with a firmness equal to that of his own authority, he subverts the principle by which he himself is established, and can no longer hope for obedience. In European monarchies, the right of succession is justly esteemed a fundamental; and even though the whole legislature be vested in a single person, it would never be permitted him, by an edict, to disinherit his lawful heir, and call a stranger or more distant relation to the throne. Abuses in other parts of government are capable of redress, from more dispassionate inquiry or better information of the sovereign, and till then ought patiently to be endured: but violations of the right of succession draw such terrible consequences after them as are not to be paralleled by any other grievance or inconvenience. Vainly is it pleaded that England is a mixed monarchy; and that a law assented to by King, Lords, and Commons, is enacted by the concurrence of every part of the state: it is plain that there remains a very powerful party, who may indeed be outvoted, but who never will deem a law, subversive of hereditary right, any wise valid or obligatory. Limitations, such as are proposed by the king, give no shock to the constitution, which, in many particulars, is already limited; and they may be so calculated as to serve every purpose sought for by an exclusion. If the ancient barriers against regal authority have been able, during so many ages, to remain impregnable; how much more those additional ones, which, by depriving the monarch of power, tend so far to their own security? The same jealousy too of religion, which has engaged the people to lay these restraints upon the successor, will extremely lessen the number of his partisans, and make it utterly impracticable for him, either by force or artifice, to break the fetters imposed upon him. The king’s age and vigorous state of health promise him a long life: and can it be prudent to tear in pieces the whole state, in order to provide against a contingency which, it is very likely, may never happen? No human schemes can secure the public in all possible imaginable events; and the bill of exclusion itself, however accurately framed, leaves room for obvious and natural suppositions, to which it pretends not to provide any remedy. Should the duke have a son, after the king’s death, must that son, without any default of his own, forfeit his title? 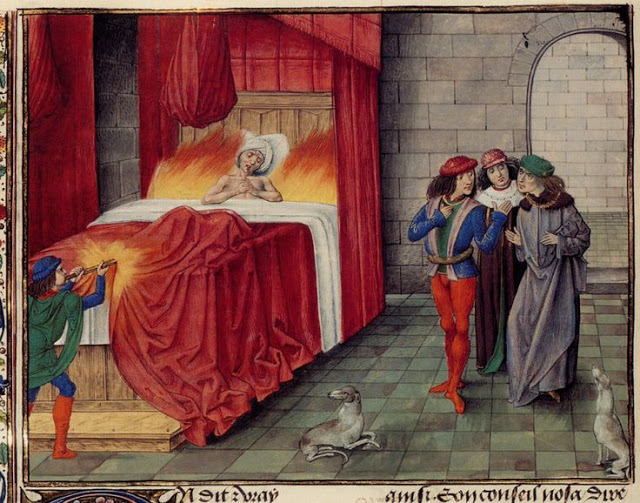 or must the Princess of Orange descend from the throne, in order to give place to the lawful successor? But were all these reasons false, it still remains to be considered that, in public deliberations, we seek not the expedient which is best in itself, but the best of such as are practicable. The king willingly consents to limitations, and has already offered some which are of the utmost importance: but he is determined to endure any extremity rather than allow the right of succession to be invaded. Let us beware of that factious violence, which leads to demand more than will be granted; lest we lose the advantage of those beneficial concessions, and leave the nation, on the king’s demise, at the mercy of a zealous prince, irritated with the ill usage which he imagines he has already met with. In the House of Commons, the reasoning of the exclusionists appeared the more convincing; and the bill passed by a great majority. It was in the House of Peers that the king expected to oppose it with success. The court party was there so prevalent, that it was carried only by a majority of two, to pay so much regard to the bill as even to commit it. When it came to be debated the contest was violent. 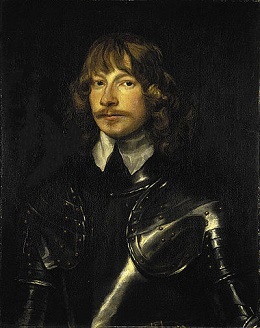 Shaftesbury, Sunderland, and Essex argued for it; Halifax chiefly conducted the debate against it, and displayed an extent of capacity, and a force of eloquence, which had never been surpassed in that assembly. He was animated, as well by the greatness of the occasion, as by a rivalship with his uncle Shaftesbury; whom, during that day’s debate, he seemed in the judgment of all to have totally eclipsed. The king was present during the whole debate, which was prolonged till eleven at night. The bill was thrown out by a considerable majority. All the bishops, except three, voted against it. Besides the influence of the court over them; the church of England, they imagined, or pretended, was in greater danger from the prevalence of presbyterianism than of popery, which, though favoured by the duke, and even by the king, was extremely repugnant to the genius of the nation. The Commons discovered much ill humour upon this disappointment. They immediately voted an address for the removal of Halifax from the king’s councils and presence for ever. Though the pretended cause was his advising the late frequent prorogations of Parliament, the real reason was apparently his vigorous opposition to the exclusion bill. When the king applied for money to enable him to maintain Tangiers, which he declared his present revenues totally unable to defend; instead of complying, they voted such an address as was in reality a remonstrance, and one little less violent than that famous remonstrance, which ushered in the civil wars. All the abuses of government, from the beginning almost of the reign, are there insisted on; the Dutch war, the alliance with France, the prorogations and dissolutions of Parliament; and as all these measures, as well as the damnable and hellish plot, are there ascribed to the machinations of Papists, it was plainly insinuated that the king had, all along, lain under the influence of that party, and was in reality the chief conspirator against the religion and liberties of his people. Portait of William Howard as a young man by Anthony van Dyck, ~1638-1640. Howard was born in 1614, and beheaded at the age of 66. 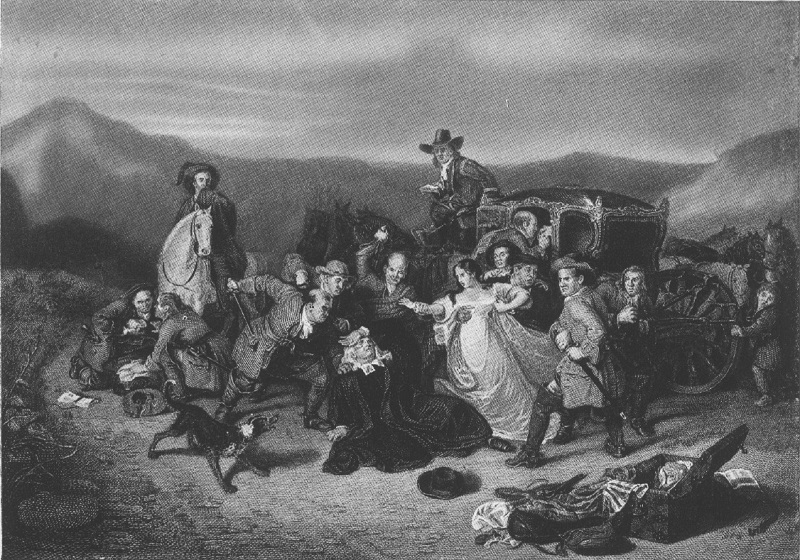 The Commons, though they conducted the great business of the exclusion with extreme violence and even imprudence, had yet much reason for the jealousy which gave rise to it: but their vehement prosecution of the popish plot, even after so long an interval, discovers such a spirit, either of credulity or injustice, as admits of no apology. The impeachment of the Catholic lords in the Tower was revived; and as Viscount Stafford, from his age, infirmities, and narrow capacity, was deemed the least capable of defending himself, it was determined to make him the first victim, that his condemnation might pave the way for a sentence against the rest. The chancellor, now created Earl of Nottingham, was appointed high steward for conducting the trial. Three witnesses were produced against the prisoner; [Titus] Oates [conjurer of the Popish Plot panic -ed. ], [Stephen] Dugdale, and [Edward] Turberville. * Oates swore, that he saw Fenwick, the Jesuit, deliver to Stafford a commission signed by De Oliva, general of the Jesuits, appointing him paymaster to the papal army, which was to be levied for the subduing of England: for this ridiculous imposture still maintained its credit with the Commons. Dugdale gave testimony, that the prisoner at Tixal, a seat of Lord Aston‘s, had endeavoured to engage him in the design of murdering the king; and had promised him, besides the honour of being sainted by the church, a reward of five hundred pounds for that service. Turberville deposed, that the prisoner, in his own house at Paris, had made him a like proposal. To offer money for murdering a king, without laying down any scheme by which the assassin may ensure some probability or possibility of escape, is so incredible in itself, and may so easily be maintained by any prostitute evidence, that an accusation of that nature, not accompanied with circumstances, ought very little to be attended to by any court of judicature. But notwithstanding the small hold which the witnesses afforded, the prisoner was able, in many material particulars, to discredit their testimony. 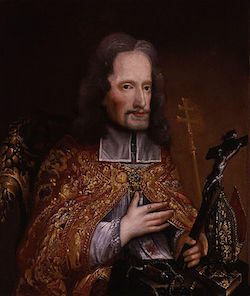 It was sworn by Dugdale, that Stafford had assisted in a great consult of the Catholics held at Tixal; but Stafford proved, by undoubted testimony, that at the time assigned he was in Bath, and in that neighbourhood. 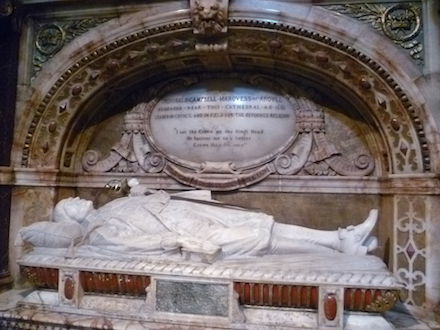 Turberville had served a noviciate among the Dominicans; but, having deserted the convent, he had enlisted as a trooper in the French army; and being dismissed that service, he now lived in London, abandoned by all his relations, and exposed to great poverty. Stafford proved, by the evidence of his gentleman and his page, that Turberville had never, either at Paris or at London, been seen in his company; and it might justly appear strange that a person, who had so important a secret in his keeping, was so long entirely neglected by him. 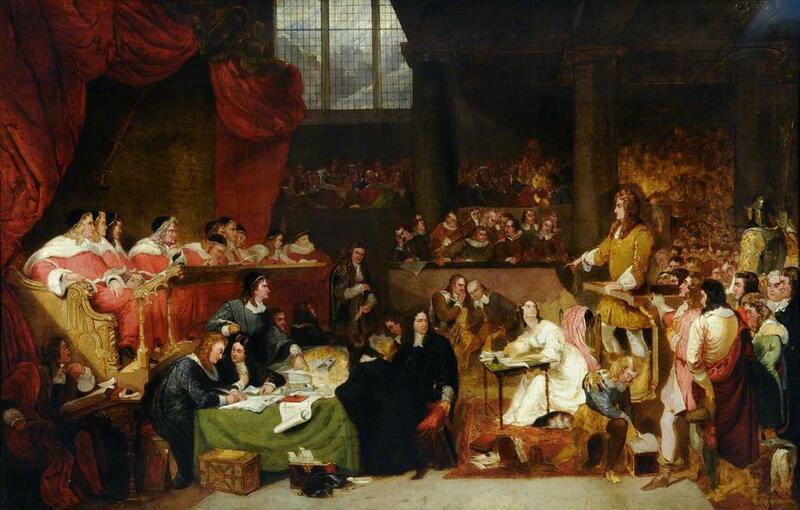 The clamour and outrage of the populace during the trial were extreme: great abilities and eloquence were displayed by the managers, Sir William Jones, Sir Francis Winnington, and Serjeant Maynard. Yet did the prisoner, under all these disadvantages, make a better defence than was expected, either by his friends or his enemies: the unequal contest in which he was engaged was a plentiful source of compassion to every mind seasoned with humanity. He represented, that during a course of forty years, from the very commencement of the civil wars, he had, through many dangers, difficulties, and losses, still maintained his loyalty: and was it credible that now, in his old age, easy in his circumstances, but dispirited by infirmities, he would belie the whole course of his life, and engage against his royal master, from whom he had ever received kind treatment, in the most desperate and most bloody of all conspiracies: He remarked the infamy of the witnesses; the contradictions and absurdities of their testimony; the extreme indigence in which they had lived, though engaged, as they pretended, in a conspiracy with kings, princes, and nobles; the credit and opulence to which they were at present raised. With a simplicity and tenderness more persuasive than the greatest oratory, he still made protestations of his innocence, and could not forbear, every moment, expressing the most lively surprise and indignation at the audacious impudence of the witnesses. It will appear astonishing to us, as it did to Stafford himself, that the Peers, after a solemn trial of six days, should, by a majority of twenty-four voices, give sentence against him. He received, however, with resignation the fatal verdict. God’s holy name be praised! was the only exclamation which he uttered. When the high steward told him, that the Peers would intercede with the king for remitting the more cruel and ignominious parts of the sentence, hanging and quartering, he burst into tears: but he told the Lords that he was moved to this weakness by a sense of their goodness, not by any terror of that fate which he was doomed to suffer. 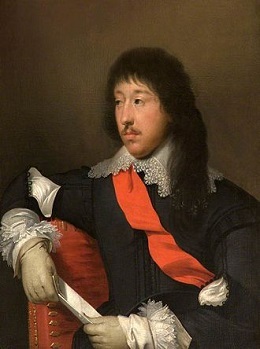 It is remarkable that, after Charles, as is usual in such cases, had remitted to Stafford the hanging and quartering, the two sheriffs, Bethel and Cornish, indulging their own republican humour, and complying with the prevalent spirit of their party, ever jealous of monarchy, started a doubt with regard to the king’s power of exercising even this small degree of lenity. “Since he cannot pardon the whole,” said they, “how can he have power to remit any part of the sentence?” They proposed the doubt to both Houses: the Peers pronounced it superfluous; and even the Commons, apprehensive lest a question of this nature might make way for Stafford’s escape, gave this singular answer: “This House is content that the sheriffs do execute William, late Viscount Stafford, by severing his head from his body only.” Nothing can be a stronger proof of the fury of the times than that Lord Russel, notwithstanding the virtue and humanity of his character, seconded in the House this barbarous scruple of the sheriffs. In the interval between the sentence and execution, many efforts were made to shake the resolution of the infirm and aged prisoner, and to bring him to some confession of the treason for which he was condemned. It was even rumoured that he had confessed; and the zealous party-men, who, no doubt, had secretly, notwithstanding their credulity, entertained some doubts with regard to the reality of the popish conspiracy, expressed great triumph on the occasion. 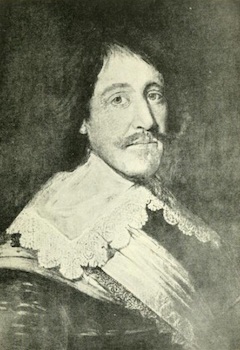 But Stafford, when again called before the House of Peers, discovered many schemes, which had been laid by himself and others for procuring a toleration to the Catholics, at least a mitigation of the penal laws enacted against them: and he protested that this was the sole treason of which he had ever been guilty. Stafford now prepared himself for death with the intrepidity which became his birth and station, and which was the natural result of the innocence and integrity which, during the course of a long life, he had ever maintained: his mind seemed even to collect new force from the violence and oppression under which he laboured. When going to execution, he called for a cloak to defend him against the rigour of the season: “Perhaps,” said he, “I may shake with cold; but I trust in God, not for fear.” On the scaffold he continued, with reiterated and earnest asseverations, to make protestations of his innocence: all his fervour was exercised on that point: when he mentioned the witnesses, whose perjuries had bereaved him of life, his expressions were full of mildness and of charity. He solemnly disavowed all those immoral principles, which over-zealous Protestants had ascribed, without distinction, to the church of Rome: and he hoped, he said, that the time was now approaching, when the present delusion would be dissipated; and when the force of truth, though late, would engage the whole world to make reparation to his injured honour. The populace, who had exulted at Stafford’s trial and condemnation, were now melted into tears at the sight of that tender fortitude which shone forth in each feature, and motion, and accent of this aged noble. Their profound silence was only interrupted by sighs and groans. With difficulty they found speech to assent to those protestations of innocence which he frequently repeated: “We believe you, my lord! God bless you, my lord!” These expressions, with a faltering accent, flowed from them. The executioner himself was touched with sympathy. Twice he lifted up the axe, with an intent to strike the fatal blow; and as often felt his resolution to fail him. A deep sigh was heard to accompany his last effort, which laid Stafford for ever at rest. All the spectators seemed to feel the blow. And when the head was held up to them with the usual cry, This is the head of a traitor! no clamour of assent was uttered. Pity, remorse, and astonishment, had taken possession of every heart, and displayed itself in every countenance. 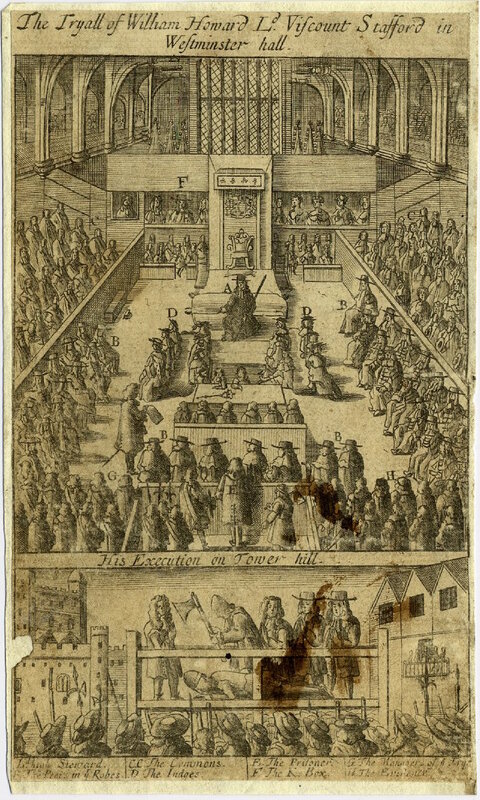 Detail view (click for the full image) of an engraving of the trial and execution of Viscount Stafford. (via the British Museum). This is the last blood which was shed on account of the popish plot: an incident which, for the credit of the nation, it were better to bury in eternal oblivion; but which it is necessary to perpetuate, as well to maintain the truth of history, as to warn, if possible, their posterity and all mankind ever again to fall into so shameful, so barbarous a delusion. The execution of Stafford gratified the prejudices of the country party; but it contributed nothing to their power and security: on the contrary, by exciting commiseration, it tended still farther to increase that disbelief of the whole plot, which began now to prevail. 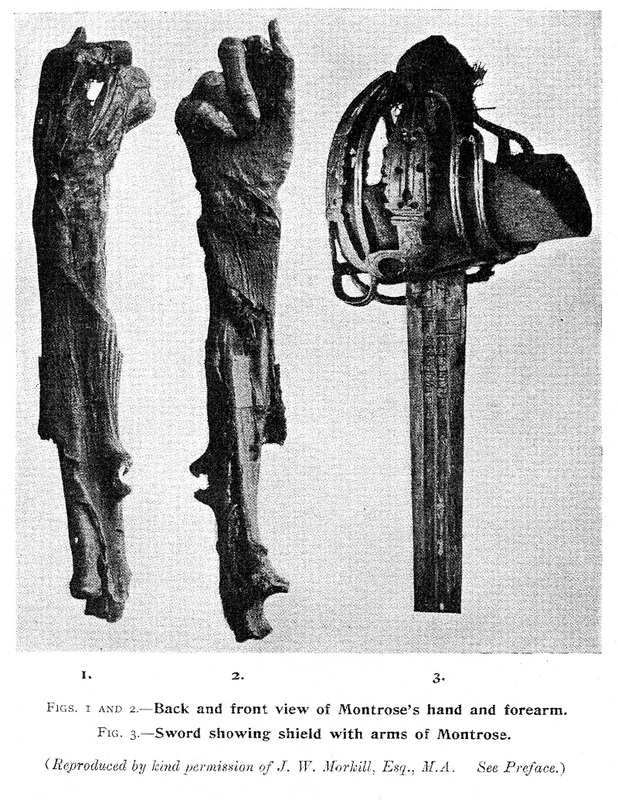 * Channeling Jacques de Molay, Stafford prophesied that Turberville, the perjured witness against him, would not outlive him by so much as a year. Turberville obligingly dropped dead of smallpox late in 1681, after falling out with his former Popish Plot conspirator Titus Oates.